The "innovative" folks on the coasts once again have had an "aha!" moment after, once again, stumbling on the Paris of the Midwest while detouring through flyover country. Why they haven't made this discovery earlier probably has something to do with that ex-Clevelander in their New York office who doesn't have enough bad things to say about the city she left while simultaneously griping about hot garbage on the sidewalk and fantasizing about moving to Denver. Oh well, the grass is always greener. Thrillist Field Guide published their article "Why You Need to Care About Cleveland's Food/Drink Scene," revealing everything that Clevelanders have taken for granted for years and marveling over just how many more things there are to do here per-capita than, say, San Antonio. Cleveland is now a destination food city... and nobody seems to know. Hello? We're still here. And we can hear you! Well, enough with the "I told you so." This is unequivocally good news, and it adds to the growing pile of positive national news about our food scene, even if they're a bit late to the party. The New York Times has had us in their crosshairs for years as one of those "unorthodox" places to visit that you'd never tell your mother about. The Chicago Tribune (via LA Times) uses generous amounts of exclamation points to express its shock that there are still operating businesses here. But that's ancient history, back in 2008, and much has changed for the better since then. We hit dive bars, markets, community gardens, beer gardens, and a ton of restaurants... some that helped define the city's culinary landscape, and some that are redefining it. Then we slept for a week. This is what we found... and best of all: it's just the tip of the iceberg. Well, I'm glad they enjoyed our average Fridays. Maybe someday they'll come back and discover we have a music scene as well. Or an airport, with direct flights to New York no less! I suppose a rag that has exclusive coverage of the Hamptons (and Dallas!) before Cleveland is probably a bit biased towards big centers of population and money rather than places rife with creativity and quirkiness. If you're dying to waste a few minutes of your life, check out how hoppin' the Dallas section is. Highly recommended reading: ten things you didn't know about Big Red. Thanks for "discovering" us, Thrillist. We'll still be here, doing what we've always done, below the radar of the east coast as always. Maybe some day you'll come cover us. We have food trucks too! 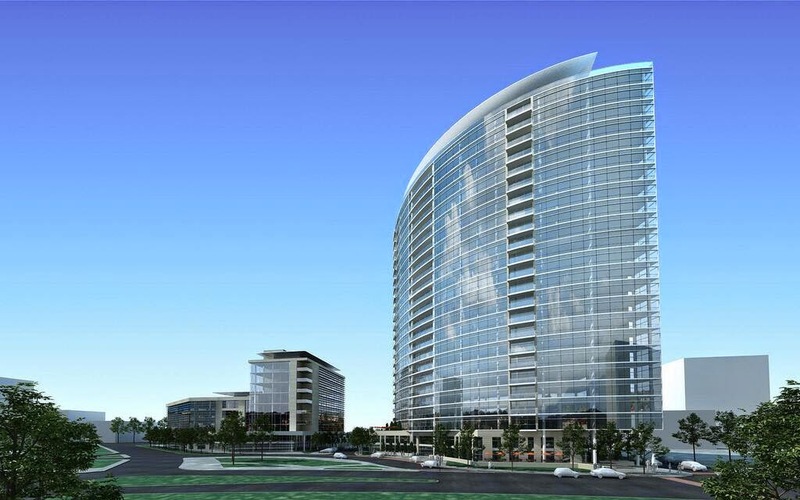 Folks who keep tabs on these sort of things will remember that some time ago, University Circle Inc. released the rendering to the left as an idea as to the kind of development it was planning in its fiefdom. University Circle, Inc. is the nonprofit community development corporation charged with fostering development and community advocacy in the neighborhoods comprising and surrounding University Circle. This organization, together with constituents like Case Western Reserve University, Cleveland Clinic, University Hospitals, the Cleveland Orchestra and several museums that make appearances in the top 10 in the country, represent the greatest philanthropic power base in the state. In other words, when they say they will make something happen, they make it happen. Several of their recent successes are evident, like Uptown, which literally created a neighborhood of apartments and shops from the sandy CWRU parking lots once jokingly referred to as "Hessler Beach." UCI is getting serious about this project. We can't ignore this one in typical Cleveland when-pigs-fly fashion. "I've never sat down with a newspaper reporter and talked about a project that hasn't come to fruition," said Mitchell Schneider, First Interstate's president. "Barring unforeseen circumstances, this is a very real project. We are spending real dollars on our due diligence and homework at this time, and we already have done so." Read full article on Cleveland.com here. Cleveland's regional transit authority maintains only rail-based public transportation in Ohio. The 37-mile system comprises a mixture of traditional light rail and a unique heavy rail transit system which uses an overhead catenary instead of a third rail. The system, while fairly robust for a city of its size, is merely a shadow of what it used to be nearly 100 years ago. Below thick layers of asphalt, lying dormant, are the bricks and rails that stitched together this incredibly efficient people-moving system. In several parts of the city, a streetcar stop was never more than a quarter-mile away (today, in Shaker Heights, it's still a half mile). Single-track interurban lines would run as far as Chagrin Falls, Chardon, and beyond. 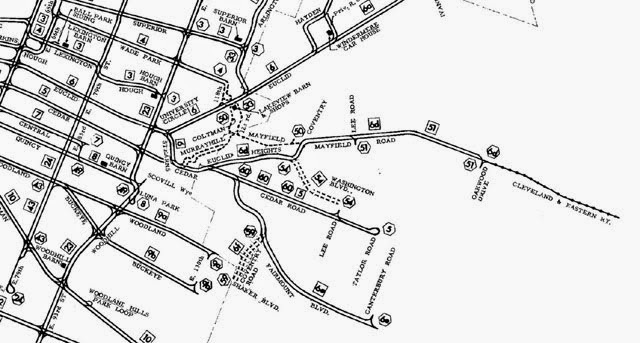 The map on the upper left encompasses seven miles centering on University Circle around 1925, just as Cleveland Heights, on the eastern half of the map, was under construction. Recently some of the history of the local streetcar system has popped up in my news feed. Cleveland Scene posted some historic photos of the streetcar system today. Check them out by following the link here. Cleveland Public Library has posted an avant-garde film, filmed in the summer of 1953, of the last runs of the streetcar system. Watch as the delicatessens roll by, ticket-takers exchange niceties with the passengers, and as an added bonus, the streetcar arrives at the underground Detroit-West 25th station. Link here for first part, link here for second part.